Hundreds of DC residents descended on the John A. Wilson Building to protest the $25 million in cuts to affordable housing programs and call on the DC Council to recognize the dire need for low-to-moderate income housing in the District. Their demands echo thousands more who voted affordable housing as the number one issue facing the District at Mayor Gray’s One City Summit in February. 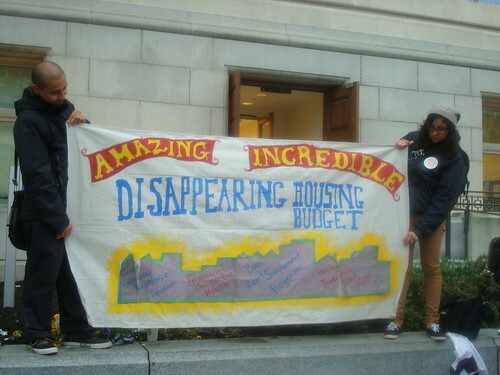 Attendees were treated to a magic show, the Amazing Incredible Disappearing Housing Budget. Housing for All organizer Elizabeth Falcon demonstrated how funds from affordable housing programs were disappearing from the DC budget. DC faces a $25 million loss in affordable housing programs from the Housing Production Trust Fund ($20 million) and the Home Purchase Assistance Program ($5 million). In addition, programs which help low income people who are homeless or at risk of homelessness with low-cost housing and needed services have been funded at a level that will not allow them to serve any additional people. At the same time, DC faces growing housing need. Under-investment in affordable housing, and dramatic loss of low cost housing in the open market have led to record numbers of families on the street and residents with a severe housing cost burden. Currently, 400 families – which means 800 kids – are temporarily housed in DC General and hotels and nearly 50,000 families spend the majority of their income on rent. DC’s affordable housing programs have a proven track record moving people out of homelessness, helping maintain job stability and educational success, and helping low-income people become homeowners. Residents who have benefited from these housing programs stood up to advocate for the programs that have changed their lives. Robert Cooke purchased his home a year ago using the Home Purchase Assistance Program with the support of Manna Inc. Robert is disabled and on a fixed income. He highlighted the benefits of homeownership to himself and the city where he is now paying property taxes and repaying his HPAP loan. “Owning a home and the road I took through Manna has really changed my life for the better. As a result of Manna’s homebuyers club, which is a part of Manna’s affordable home ownership services and the city’s home purchase assistance program known as HPAP, I was able to become a homeowner. Without these two things I don’t know where I would be.” Robert argued that others should be able to fulfill his same dream of homeownership. Click on the picture above for a slide show from the rally. See what people were saying on Twitter.